A flash crash is when a market, whether stocks, bonds, or commodities, plummets within minutes and then rebounds. Different things can set it off, but computer trading programs make any crash worse. These "bots" use algorithms that recognize aberrations, such as sell orders. They automatically react by selling their holdings to avoid further losses. When a world event, or a computer glitch, tell these programs that something unusual is happening, they automatically sell according to their code. These trading programs make any stock movement more intense, thus adding risk. The concern is that one of these crashes could cause a recession. A typical stock market crash signals a loss of confidence in the economy. When confidence is not restored, it leads to a recession. Investors usually realize a flash crash is caused by a technical glitch, not a loss of confidence. But if a flash crash lasted long enough to causes concern, it could trigger that confidence loss. It would also destroy wealth for investors. If it lasted long enough, it might even frighten consumers into buying less. At the wrong phase in the business cycle, it could be just enough to trigger a recession. The floor of the New York Stock Exchange stopped trading for three hours and 38 minutes on July 8, 2015. Trading was quickly shifted to the eleven other exchanges, including the NASDAQ, BATS, and many "dark pools." The NYSE only accounts for 20% total trading, down from about 80% 10 years ago. On October 15, 2014, the yield on the 10-year Treasury note plunged from 2.0% to 1.873% within a few minutes. It quickly rebounded. The plunge made it seem like a sudden surge in demand for these notes. Bond yields fall when prices rise. It was the biggest one-day decline since 2009. Volume was double the norm. What caused it? 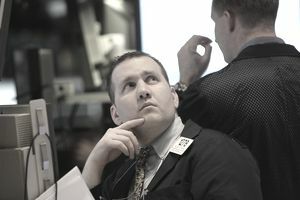 Many blame the algorithm-based programs responsible for nearly 15% of trading in U.S. Treasurys. It's part of the 60% of trading done electronically, instead of over-the-phone. That speeds up any reaction in the market. There was also limited liquidity in bonds available to sell. There were 54% fewer 10-year notes for sale than normal. On May 6, 2010, the Dow fell 1,000 points within 10 minutes. It was the biggest point drop on record, costing $1 trillion in equity. By the end of the day, it recovered 70% of its lost territory. The euro plunged to a one-year low against the dollar. A flight to safety drove gold up to $1,200 an ounce. It knocked the 10-year Treasury note yield down to 3.4%. What triggered the sell-off? A London suburbanite, Navinder Sarao, was sitting in his home using a personal computer. In 2015, investigators found that Sarao made and quickly canceled hundreds of "E-mini S&P" futures contracts. He engaged in an illegal tactic known as “spoofing.” As a result, Waddell & Reed destroyed liquidity in the futures contracts by dumping $4.1 billion worth of contracts. The CME Group warned Mr. Sarao and his broker, MF Global, that his trades were supposed to be executed in good faith. Spoofing manipulates the market price by falsely building up the price, then quickly selling them for a profit. At the time, everyone thought the crash was caused by the Greek debt crisis. The county's debt had just been downgraded to junk bond status by rating agencies. It created riots in the streets. If the ECB let Greece default, it could trigger defaults by other debt-laden countries like Portugal, Ireland, and Spain. Investors who held these countries' bonds would have incurred huge losses. Since many of these investors were banks, Libor rose. It's similar to what happened during the 2007 bank credit crisis. This created fear of a credit freeze in European banks. Like many other past crashes, it did not lead to a recession. The NASDAQ is infamous for flash crashes. On August 22, 2013, the NASDAQ closed from 12:14 p.m. EDT to 3:25 p.m. EDT. One of the computer servers at the NYSE couldn't communicate with a NASDAQ server that fed it stock price data. Despite several attempts, the problem couldn't be resolved, and the stressed server at NASDAQ went down. NASDAQ computer errors also caused $500 million in losses for traders when the Facebook initial public stock offering was launched. On May 18, 2012, the IPO was delayed for 30 minutes. In other words, traders could not place, change or cancel orders. Once the glitch was corrected, a record 460 million shares were traded. Michael Lewis, the author of "Flash Boys," said that the presence of these high-frequency trading programs means that the individual investor cannot get ahead. The programs take in massive amounts of data and make split-second decisions and trades long before a human can. Companies who use them, like Goldman Sachs and JP Morgan, haven't lost on a trade in years. For the average investor, says Lewis, the stock market is rigged. On CNBC, Lewis defended his research to the CEO of BATS, the second largest exchange behind the NYSE. Like the NASDAQ, it's an all-electronic exchange, only larger. Billionaire investor Mark Cuban said the risk of a bigger flash crash is far worse than any "market-rigged scalping." If Wall Street isn't rigged, it may as well be as far as you're concerned. There is no way an individual stock picker can collect more information than these computer trading programs. That's why so many asset classes move in tandem. These programs aren't regulated, either. The situation is not hopeless. Although it's impossible to out-think these programs on a day-to-day basis, you can tell where the market is headed by following the business cycle. Keep a well-diversified portfolio. Adjust your asset allocation each quarter to make a decent return. Remember, it's not how much you make, but how little you lose.